This is a post about nothing in particular. There is no rhyme or reason to it whatsoever. Far from it. As hard as I try, I can't even link any of the random mishmash together to form some kind of theme with a cool title. So I'm stuck with the very random one above. Firstly, I guess I'd better explain 'Mah belt'. Imagine for a moment the Black-Eyed Pea song 'My Humps'...if you can remember it. I You-Tubed it and would have linked the video, but it's kinda suggestive and I'm not really into lots of scenes of women thrusting their backsides. But you get the drift. There's one line in the song...which is really annoying and sticks in your head where they just sing 'Mah hump...mah hump, mah hump, mah hump'. So take that line and replace it with 'mah belt...mah belt, mah belt, mah belt'. I really, truly thought I'd lost my favourite belt before Christmas. I was gutted. Like irrationally so. But this belt is one of the favourite things in my wardrobe. It's super stretchy so it doesn't matter whether I'm having a thin or fat day (I wore it right through my last pregnancy - just a little lower than usual!). And it pretty much goes with everything and I wear it a lot. A lot. So when I couldn't find it after searching multiple times right before we went away on holiday, I was sure it was gone burger. I've never seen another one quite like it and nor did I fancy having to find a replacement. So I was gutted. Ze bathroom eez painted. Finishimo. Yeah, um don't look too closely I did take these shots in my pyjamas. And thank blimin goodness for that says hubby after hours of sweltering up in the 30-40 degree heat of the tiny room. Not helped by having to redo one nasty patch of the wall where the paint had peeled. It still isn't 100% level with the rest of the wall but its not that noticeable in most lights. The colour really freshens up the room and hopefully it will be another 10 years before we have to think about doing it again. 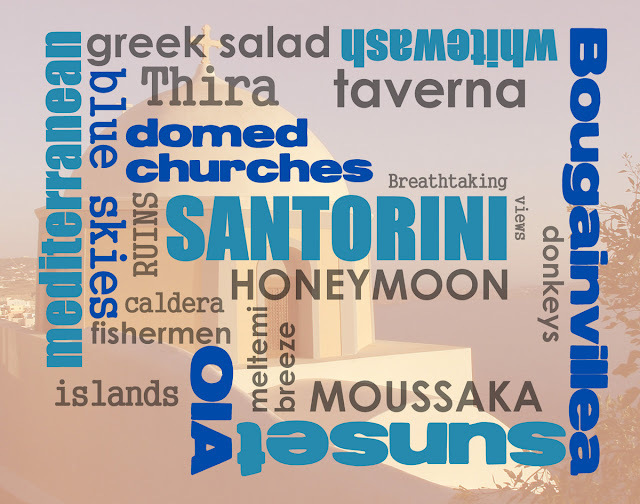 And now I've just the excuse to do another word art photo for the bathroom wall. It is actually using the words from the original Santorini print I did that I've never, ever been happy with. It's been up on our bedroom wall for 2 years and it's bugged me the whole time. I meant to do a better job of displaying it but got halfway through the project and got stuck for inspiration. Meh. So now it has a chance to redeem it self in Mark II. And it should go nicely with this other favourite of ours we brought back from the beautiful island. And thanks Snapfish for your 50% off print enlargements till Monday...don't mind if I do! I think I must be nearly their best customer what with all the photobooks, photo boards, and Kiwi summer prints I've put their way the past few months. Speaking of photobooks, a few people asked me how I put together the Photobook I showed on the blog last week, so I'm in the middle of writing up a How To tutorial...coming soon to a blog post near you. 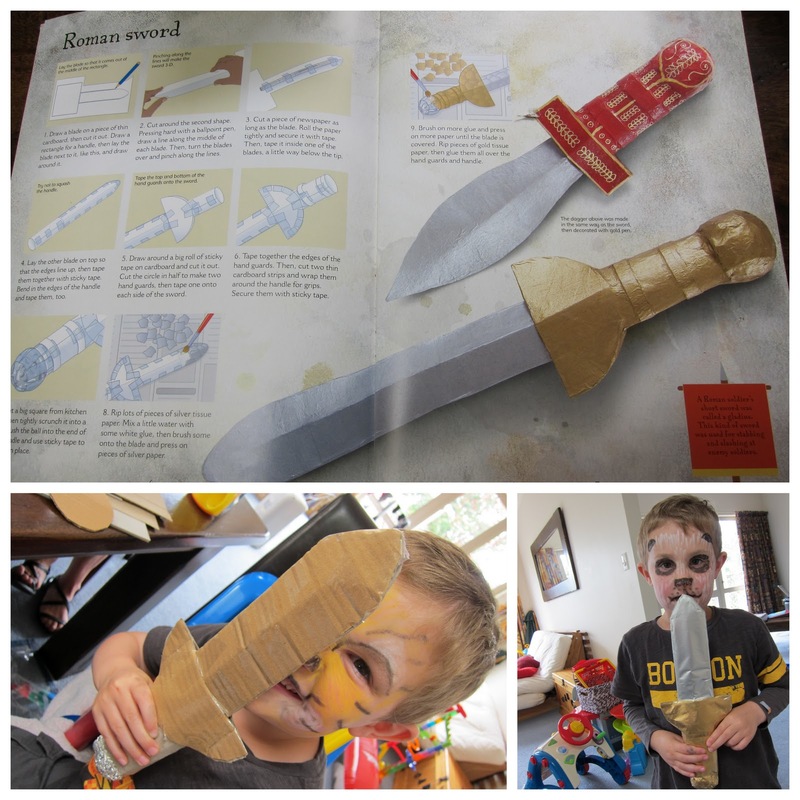 In other crafty fun, we rediscovered our 'Roman Things to Make and Do' book last week. I got roped into making a dagger. Don't ya love crafting with kids where they tell you want they want to make, but then you pretty much end up doing the lot? Or is that just cos I'm a perfectionist and want it to look good? I haven't quite decided. That was followed hot on the heels by a couple of first face painting attempts from me - with cool face paint Christmas cracker crayons that are easy to work with. Not so easy to get off however. Poor Noah had half his face scrubbed off in the process. And yet he was game enough to do it again a day later...and it was even worse to get off the second time...sucker! We also rediscovered our Thomas train set. But didn't notice one of the trains leaking battery acid all over the carpet until hours later. %*@!#*. And the Google search results were so very right when they described battery acid as one of the worst stains to ever have to try to remove. Carpet cleaner couldn't do it despite several applications. A recommended white vinegar and water mix proved a little better but there are still 3 noticeable marks. Grrrrr. Future note to self: take the batteries out of the trains if you're not going to play with them for a while! Not especially known for our DIY skills (painting is usually about our limit), it's with more than a little trepidation I tell you this. On the weekend we're going to attempt some long overdue (like four years) waterblasting outside. Dirt, grime and green slime you won't know what hit you! I just hope it doesn't turn into one of those jobs that starts out small....and then suddenly you realise you've just spent the entire weekend on it and only 1/8 of the job is done. Sheesh, gotta think positive. We'll blitz it. We will. We will. And three of Mylo's first molars have appeared in the space of a week. No wonder he's been a tad tetchy lately. Right on time according to the experts. I could have sworn the eye teeth came before the molars, but apparently not! And that's that. The mountain of mishmash has come to an end. For now. Thanks for listening. p.s. Have I told you that I'm so excited to have 'mah belt' back? Wait, I did already? Oh go on, let me just one more time....puhleeeze! Cool post. Made me giggle all the way through. Not sure why!!! But gee you've been busy!! And having some fun. Awesome effort. That's a whole lot of mishmash! Keep it up!! Ha - a mishmash is a good way to go! 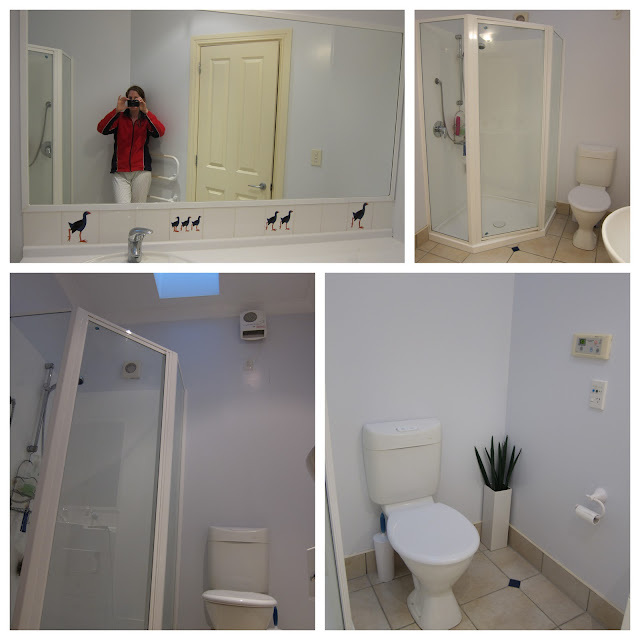 Love the bathroom - size and colour! And arghh your teeth thing just reminded me that I need to get my girl to the dentist! Glad you found your belt! I get very attached certain things and I HATE losing things! 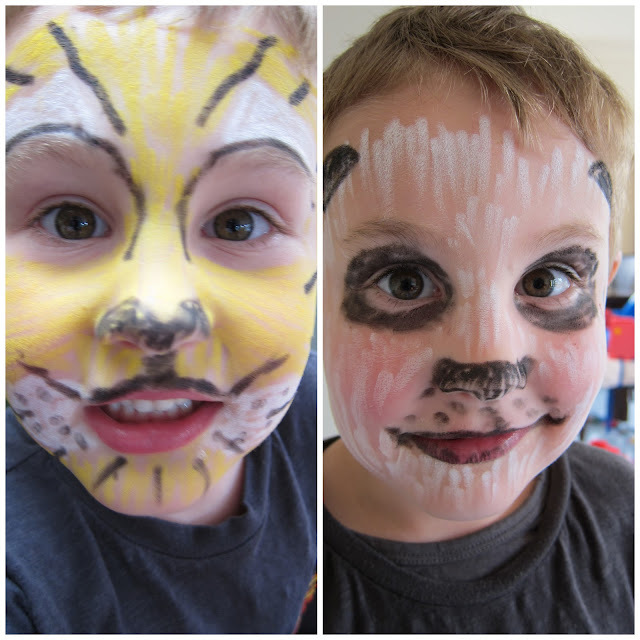 Drives me crazy... And good effort on the face painting- really creative!